We are now in the implementation phase of the project; equipment is being consolidated in Fremont, California. Customs brokers in the USA and New Zealand have been selected, and the New Zealand Government issued us an import / export license to ship the equipment to and from the country. We're happy to announce that Elecraft has signed on to be a supplier of radios and amplifiers. Details are being finalized and will be posted on this wsebsite. We appreciate Elecraft's continued support of our projects. Please join us in welcoming Vadym UT6UD to the team. Many of you may know Vadym from the Top Band. He was a member of the 2016 Heard Island DX-pedition team. You may read his CV Here. Welcome aboard Vadym! 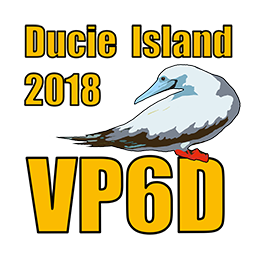 We're happy to announce that VP6D Ducie Island 2018 DX-pedition received a grant from the Northern California DX Foundation. We appreciate the continued support from the Foundation.